We're seeing fresh things in bedside tables... Lacquer with it's glossy elegant finish is catching limelight and sure to elevate the nighttime book in hand unwind. Specialty hardware and bases in different metallic finishes such as gold leafed bamboo pulls, chrome tassel pulls and brass bases show off a sense of refinement. Current textured finishes that fascinate us are the pearl like capiz shell drawer fronts and wrapped geometric grasscloth. These luxurious finishes and intriguing textures create furniture that feels custom, fresh and eye catching. 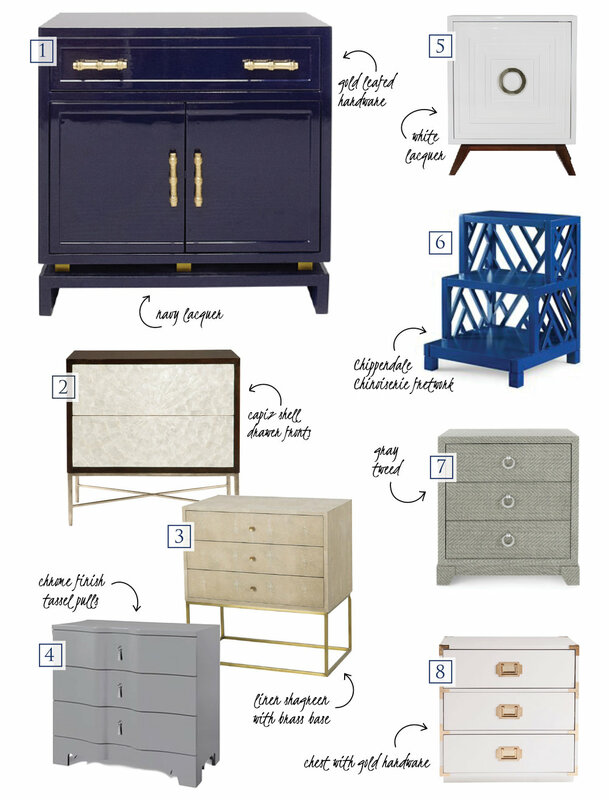 Here's a detailed list of these nightstands 1) Marcus from Worlds Away 2) Adagio from Bernhardt 3) Hedy Regency from Kathy Kuo Home 4) Brigitte from Bungalow 5 5) Cooper from Worlds Away 6) Nantucket from Bungalow 5 7)Brittany from Bungalow 5 8) Loren+End table from Wayfair.